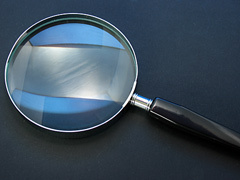 We stock a large range of magnifying glasses ranging from powerful eyepieces, foldaway lenses and general purpose magnifiers especially useful for the needs of collectors. 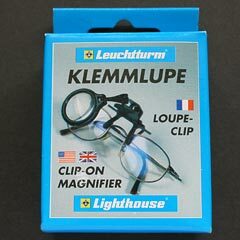 Magnifying glasses for your desk or for carrying around, available with plastic lenses and glass lenses. 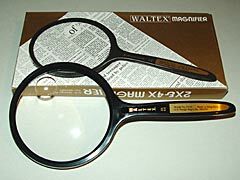 Excellent magnifying glasses for reading fine print and for viewing very small and hidden detail. 42mm across its widest part with a circular plastic lens. 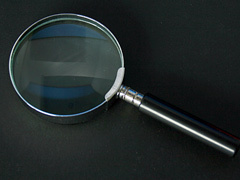 It is ideal for viewing very small items and very fine detail. Takes a little practice to use well, but well worth the effort! 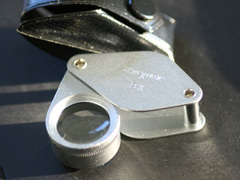 A very strong 18mm 10 times magnifier and extremely powerful 6mm 20 times magnifier in a metal construction foldaway pocket magnifier. 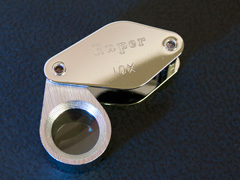 Supplied with a plastic holder, it is ideal for viewing very small and extremely fine detail. Made in Japan. 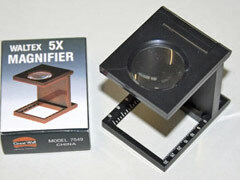 A fairly powerful 6x fold out stand magnifier with measurement scale that is ideal for viewing small and fine detail. 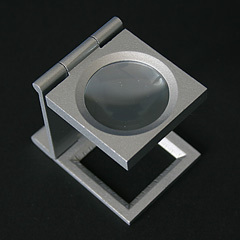 Metal construction with glass 30mm diameter lens, this magnifier is also called a linen tester. New stock is blak and comes with small black pouch for carrying and storage, also supplied in plain box. Good quality traditional glass lens magnifying glass with metal frame. Approx 100mm lens (4" lens). 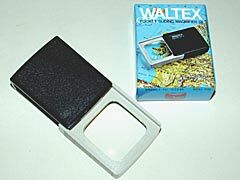 Multi purpose, ideal for small print, newspapers, books, maps photos and much more. Comes supplied in a retail box. Good quality traditional glass lens magnifying glass with metal frame. Approx 115mm lens (4.5" lens). Good quality traditional glass lens magnifying glass with metal frame. Approx 125mm lens (5" lens), magnification is about 1.75x. Multi purpose, great for newspapers, books, maps, small print, photos and much more, this is a heavy item, approx 400g. Comes supplied in a retail box. This is a fairly powerful 5x stand magnifier with measurement scale that is ideal for viewing small and fine detail. 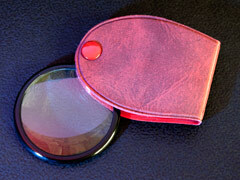 All plastic construction, this magnifier is also called a linen tester. Good quality traditional glass lens magnifying glass with metal frame. 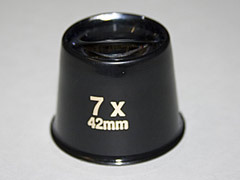 Approx 62mm lens (2 1/2" lens). Multi purpose, ideal for small print, maps photos and much more. Comes supplied in a retail box. 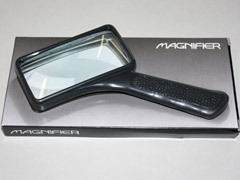 Special Offer - Good quality traditional glass lens magnifying glass with black plastic frame. 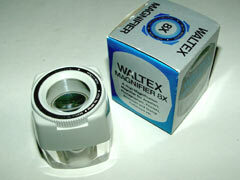 Approx 72mm lens (3" lens), magnification is about 2x. 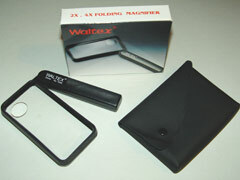 Multi purpose, great for newspapers, books, maps, small print, photos and much more. Comes supplied in a plain box, magnifier is similar to illustration..
Optical quality acrylic lens and all plastic construction, this is an ideal lightweight and pocket friendly magnifier. 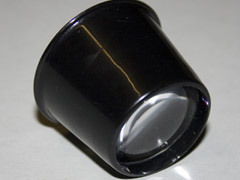 Great value and also suitable for junior collectors, lens measures 37mm across. 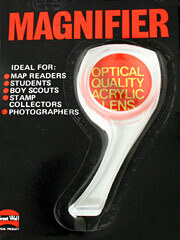 This is a useful pocket magnifier with a 45mm circular glass lens. With its blue foldaway soft case, it is ideal for carrying and general usage. (now supplied in blue cover, not red). 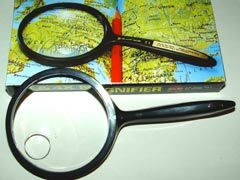 Magnifying glass to clip on to reading glasses and spectacles. All plastic construction, 30mm diameter lens giving a 5 times magnification. Flexible swivel joint allows easy positioning and removal of the lens and the sprung clip mechanism is rubber tipped to avoid damage to glasses. Fits almost all glasses. 42mm across its widest part with a circular plastic lens. It is ideal for viewing very small items and very fine detail. Takes practice to use well! 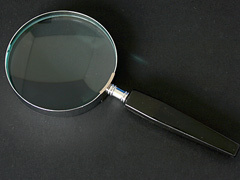 Supplied plain boxed,smaller and lighter than our 8x magnifier, it is ideal for viewing very small and very fine detail. Made in Japan. 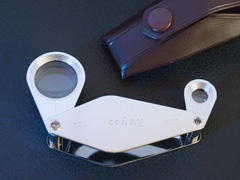 A very high quality metal and a single 3 glass lens, powerful 20mm 10 times magnifier, foldaway type pocket magnifier. Supplied with a soft plastic holder, it is ideal for clearly viewing very fine detail. Excellent gift, quality optics made in Japan. 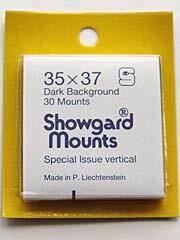 Supplied with a plastic pocket case, it is ideal for viewing very small and very fine detail. Made in Japan. With its slide away plastic lens and all plastic construction this is very safe and suitable for going in a pocket or bag. A very high quality metal and glass construction strong 25mm 8 times magnifier and powerful 12mm 15 times magnifier, foldaway pocket magnifier. Supplied with a soft plastic holder, it is ideal for viewing very small and extremely fine detail. 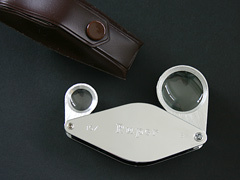 Fantastic gift, quality optics made in Japan.